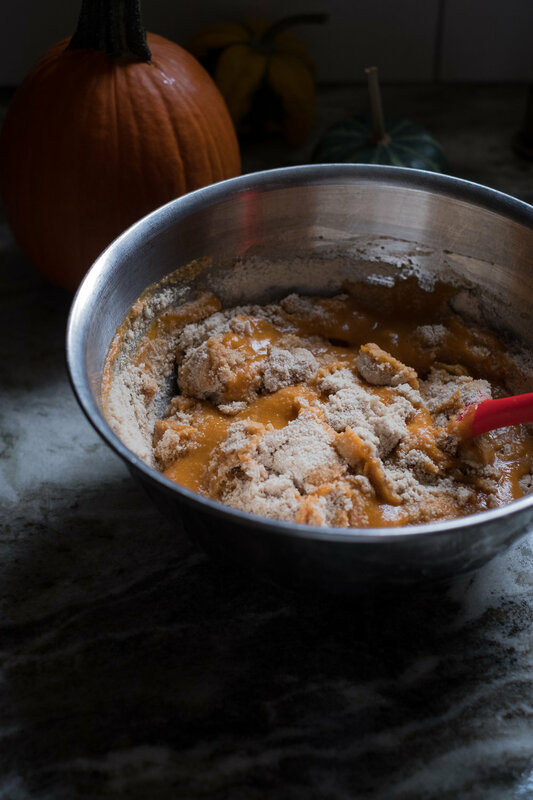 Recently, the convergence of beautiful fall weather, a craving for something made with pumpkin and finding this excellent recipe resulted in several days of muffin making. 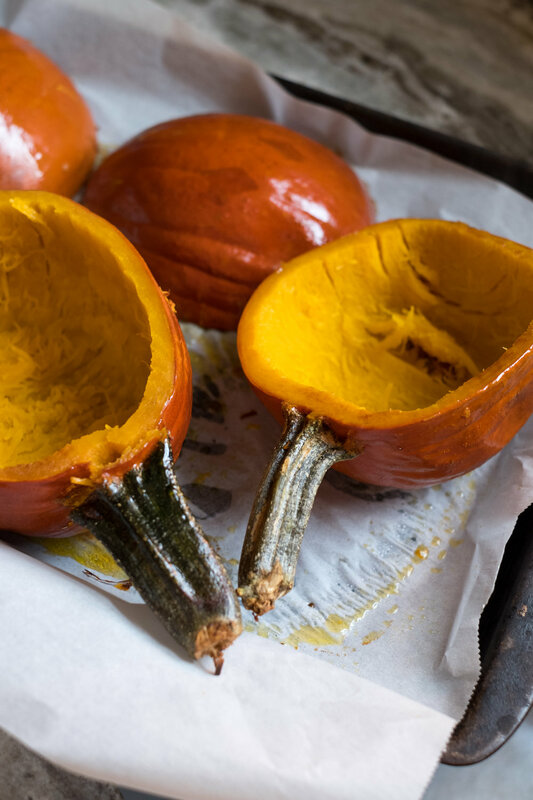 I had two small pumpkins leftover from an autumnal display, which I sliced in half and roasted in the oven until soft and mash-able. After great success making several batches I got inspired to swap out the pureed pumpkin for diced apple and grated zucchini. This too resulted in a muffin that was excellent in taste and texture. Then I baked batches using mashed banana, roughly chopped walnuts and dark chocolate chunks. Success again! The variations seem endless, actually. I’m imagining a savoury one with goat feta and rosemary. But I’ll stop at three for now. These muffins are nutrient dense and make a substantial snack between meals or as a breakfast on-the-go. Even so, they're surprisingly light in texture. A dozen freshly baked muffins doesn't last long around here, which is why I like to bake a double batch. What doesn’t get eaten that day is placed in something air-tight and stored in the freezer. I find the muffins get more moist than I like after a day or two at room temperature. Before eating, I pop a frozen muffin in the microwave for 30-35 seconds. It's as if I'm eating one just out of the oven! Here’s a basic recipe you can adapt. Makes 12 muffins. To wet mixture add 1 cup grated zucchini and 1 apple, cut in small cubes. To dry mixture add 2 tsp ground ginger. Combine dry and wet mixture and fold in 1 diced apple. To wet mixture add 2 small or 1 cup mashed ripe bananas and 1 tsp vanilla. Combine dry and wet mixtures and fold in 1/2 cup walnuts, roughly chopped and 1/2 cup dark chocolate, roughly chopped. Preheat the oven to 350 F' and grease a muffin tin or use liners. In a large mixing bowl, combine the eggs, maple syrup and oil really well with an egg beater, electric beater or whisk. 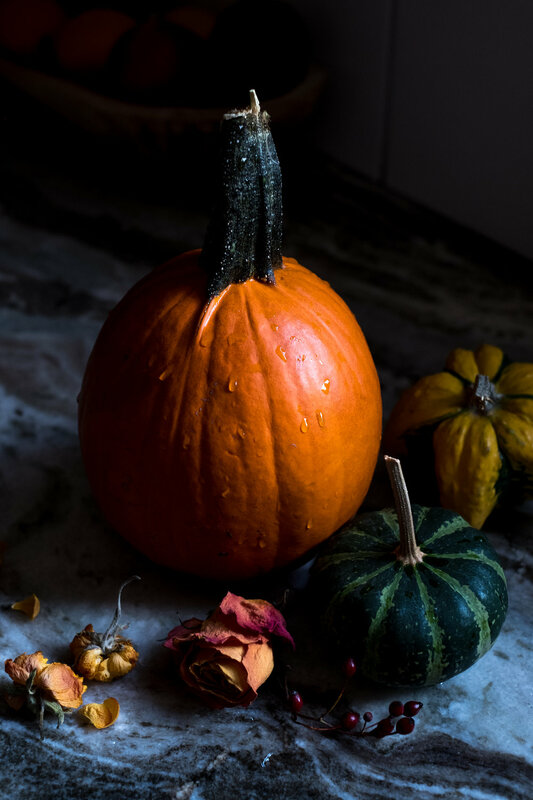 Depending on what kind you are making add either pumpkin puree, mashed banana and vanilla or zucchini. In a separate bowl add the coconut flour, almond meal, baking soda, salt and (if using) spices. Whisk well. Add dry mixture to wet mixture and combine well. Fold in either chopped chocolate and walnuts or diced apple. Distribute the batter between cups. Bake on the middle rack for 25 to 30 minutes or until a toothpick comes out clean.